Community Radio KNON 89.3 FM currently has 10 different blues and R&B programs each week. Each program is unique and much of the music that is played comes from the volunteer DJs' personal collections. All of KNON's blues DJs support local music and you can count on hearing tracks by local blues bands on every show. I have done the Friday blues show there since 1983, currently at 6 pm to 8 pm, and I am also the Blues Format Director. Mailing address: KNON Blues, 11311 North Central Expressway, suite 105, Dallas, TX 75243. KNON also streams live on the internet at KNON.org. 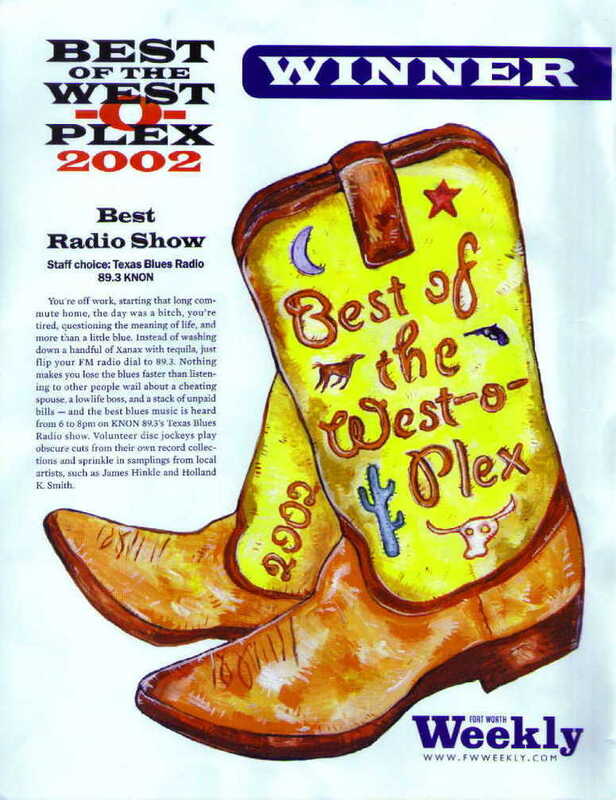 KNON's Texas Blues Radio show was named Best Radio Show by the Fort Worth Weekly in 2002. See the award here . 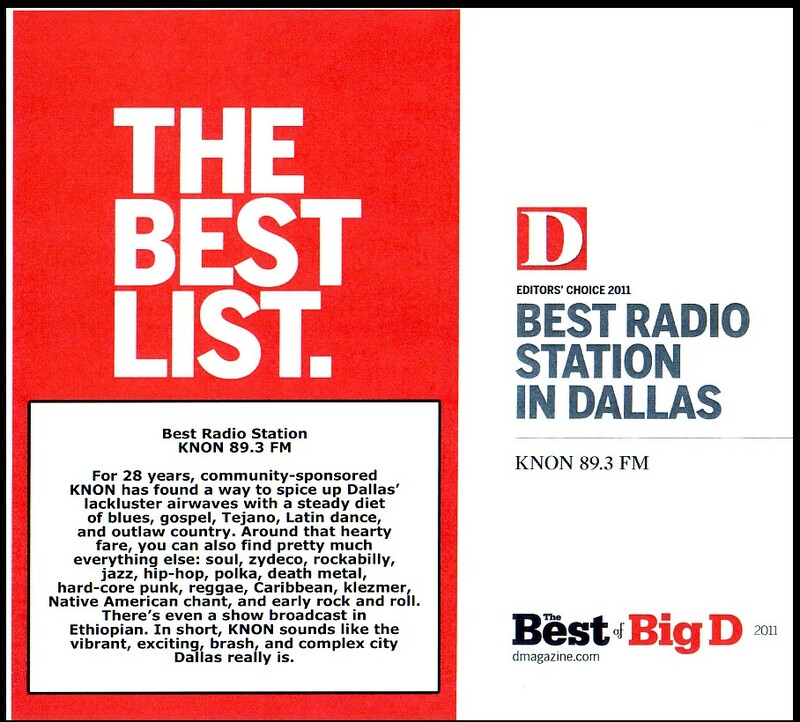 KNON was named the Best FM Station by The Dallas Observer in 1992 and 1995. 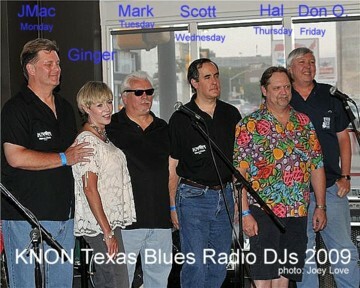 KNON was named Best Radio Station in Dallas by D Magazine and the Dallas Observer for 2011. See the awards here and here. 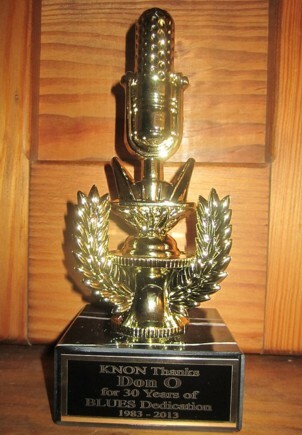 KNON was named Best Music Radio Station by The Dallas Observer for 2012. See the award here. KNON was named Best Music Radio Station by The Dallas Observer for 2014. See the award here. KNON Texas Blues Radio CD Volume 5 our 5th ALL LOCAL ALL ORIGINAL blues compilation CD. On sale NOW as both physical CDs and MP3 downloads.